Hi, I need to make a registration page to my Private Silkroad server on my website, and it works with SQL Server 2012. Well...this is all i think. DB Server IP and PW i dont have them right now because we are moving the files to other server. Can be possible to make a "Validate Email Address" ? I dont know how to do that neither. Thank you so much for your cooperation and help!!! ps: I know that a lot of people will see this article since there's no information around the web. So if I got this done I can help anybody who needs it. Just find me around the web with my nickname :). lord0o. 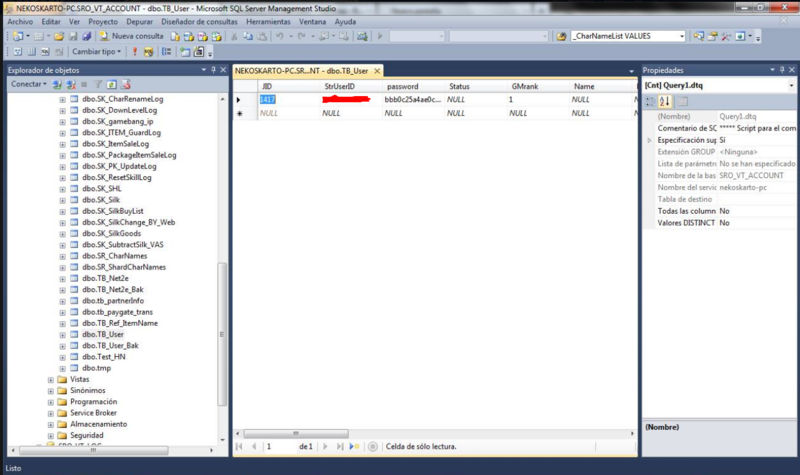 its SQL SERVER 2012! Not MySQL! This isn't a site where we just supply code for you but we will help with any specific coding questions you have. I'm guessing you don't have any code at the moment so maybe a brief overview of what you will need to do will be helpful. 1) Collect the users registration info in a form (HTML). 2) Validate all the info, compare passwords, generate MD5 hash of password etc. (PHP). 3) Enter all information (only MD5 hash of password, not the raw one) into a temporary database (T-SQL or ANSI SQL by the look of things. Done via PHP). 4) Send email confirmation containing a random code that is also stored in the database (PHP). 5) Once the user clicks the link in the email, compare the confirmation code in the email wih the one in the database. If the codes match, enter all user info into the real user database and delete entry from temporary database (PHP and T-SQL or ANSI SQL). If you have specific problems with any of the steps, post the code you have issues with and we will help as much as we can. Oh I overlooked and misunderstood. But we can help more precisely if you can share your efforts here.